I had the opportunity this week to ride the double decker bus for the first time. 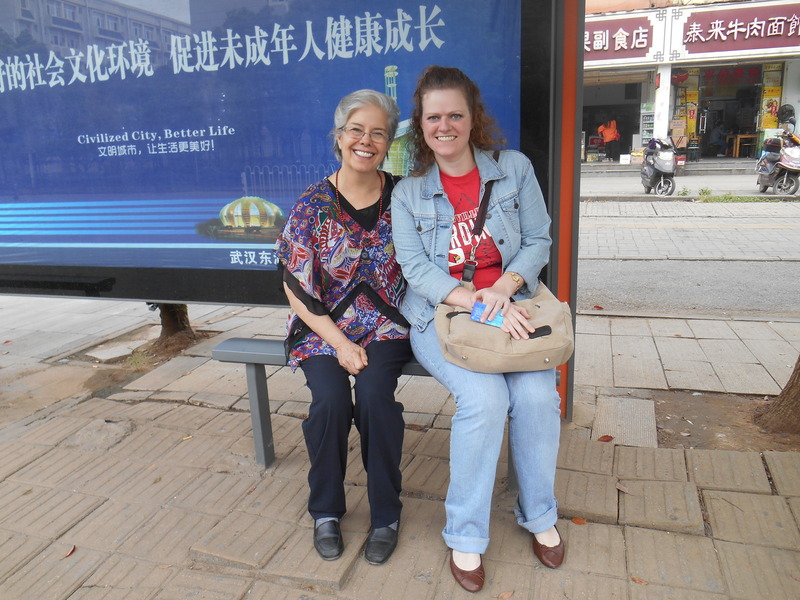 This is actually only the second time for me to ride a bus period since I’ve been in Wuhan. Usually you can either pay 2 quai in cash or use your bus card which only charges you 1.60 quai. Using my bus card that Kristen helped me get a week or so ago was super easy, you just hold it up to the money thing when you enter the bus, and wha-laa the light turns green. Today Edwin, Mary and Angela showed me how to get to METRO. It’s the China equivalent of Sam’s Club and the only place it town to get many American brands. I was able to find Hunts spaghetti sauce, Hines 57 ketchup, and Skittles. Mary even found Honey Bunches of Oats. The prices are fairly high so it’s not somewhere to go everyday, the vegetable market is defiantly cheaper for food and stuff, but it was a nice touch of home. I took my city map (no English labels on it btw) and highlighted the route from the front seat of the top deck of our bus. It was pretty neat to be able to mark landmarks of each place as we passed it, and now I know where this bus goes if I ever want to venture out on my own in the future. In the past two days I have gotten pretty familiar with this route. 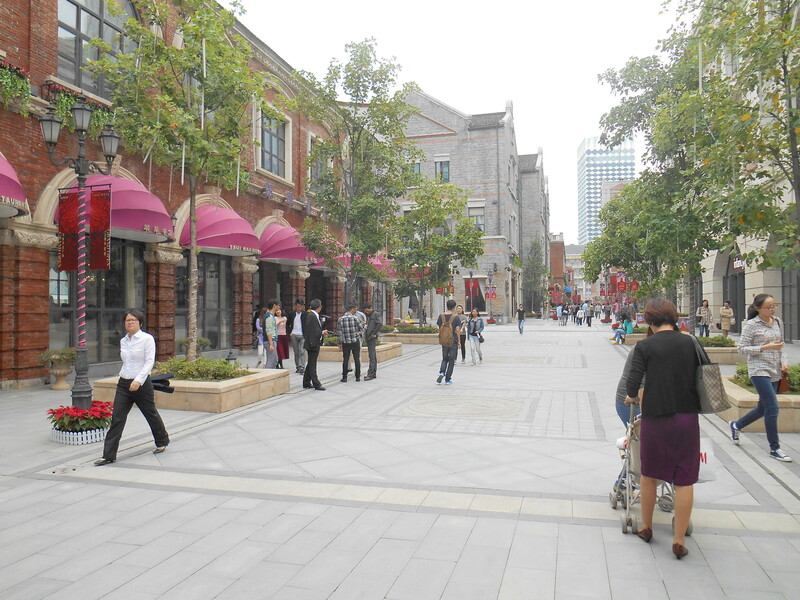 I’ve traveled to Guanggu the shopping center where my grocery store Carrefore is located and walked around Hann Street where the upscale shops for clothes, restaurants and such are. On a side note, I finally found a pair of shoes that fits. Hooray. I have already worn out my first pair of ballet flats from walking so much during the last month and needed another pair of dressy flats to teach in. My feet are a size 41 and most stores here only carry a 39 or below. It’s not like I’m Big-Foot or anything, by American standards a 9 1/2 is a pretty reasonable shoe size, but in China it has taken me weeks to find shoes. I was pretty pumped when H&M carried my size. H&M is a European brand that is pretty famous in the U.K. though I had never heard of it when I lived in the U.S. This is Hann Street. It was pretty cool. Some of the shops were really expensive, but we did find one that was reasonable to stop in for lunch. I have been missing American food, and so I was excited to find out the restaurant had Island Shrimp Spaghetti. 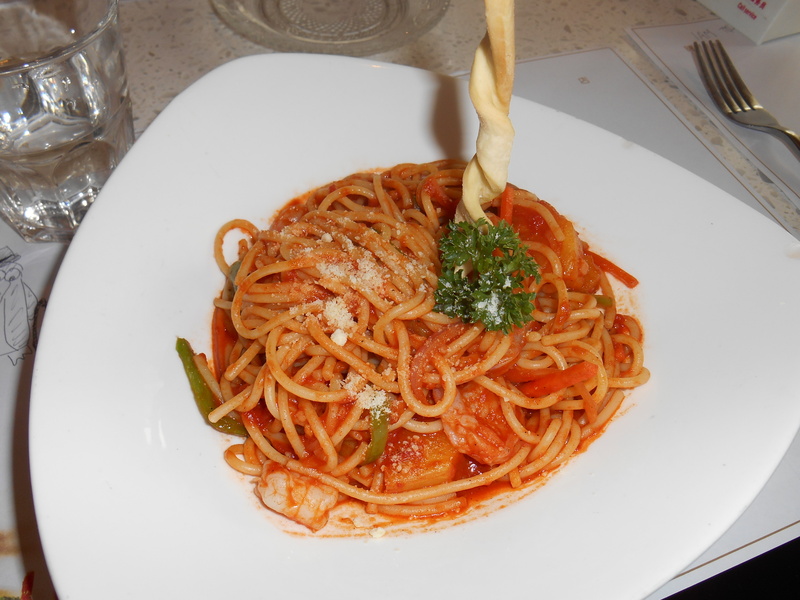 It had marinara sauce with pineapple, shrimp, onions and peppers on a bed of spaghetti. It was pretty delicious. My favorite part is the swizzle stick of bread sticking out of the top of it. 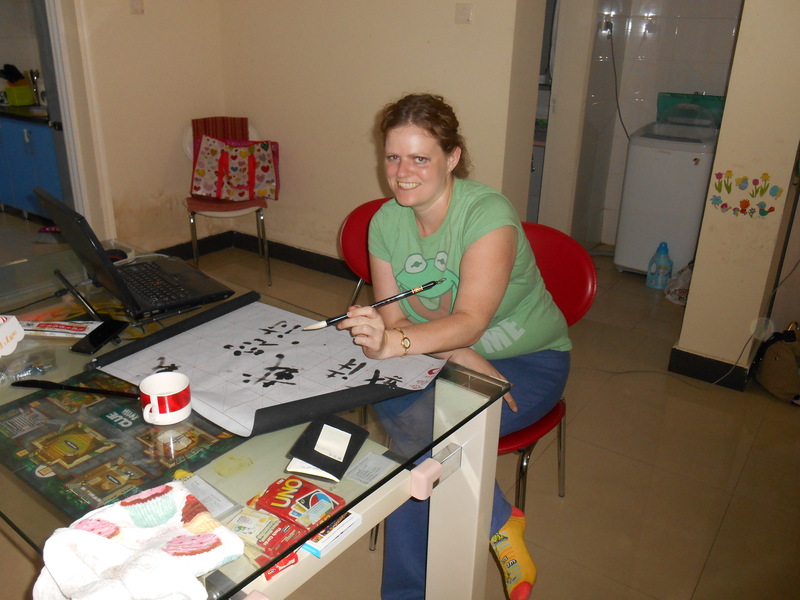 Amy (a chinese friend) came over the other night and helped to teach me Chinese Calligraphy. Another Chinese friend has recently given me a Chinese name ( 戴睿诗 – dai rui shi) which roughly translates to intelligent, farsighted poem. Amy’s letters were much more graceful compared to my scrawled mess of letters, but it was really fun. You can see her calligraphy practice mat here. It’s the coolest thing I’ve ever seen. It’s a thing sheet of white silk with a thick black felt on the back. You just use water to wet the brush then paint. When the matt dries it’s white again and you can continue practicing. It was great for me because I need a lot of practice. Amy bought a couple dragon fruit from a street vendor on campus and they were absolutely delicious. I had never tried this before. It tastes similar to a kiwi only the fruit is white instead of green but it has those little black seeds all through it. Friends, food and Artsy stuff made for a great night. I love the pics and I think you look great!! I’m glad you found a resturant with a little American food. It looked delicious. You need to show some pics of your calligraphy. What the lines or style of writing means. Miss you! So good to hear from you! I hope everything is going well with you all. Juanita sent me a picture of Willie and the crew in Africa. It was an amazing photo, I’m sure they have some great stories to tell regarding their time there. I will try to post some more calligraphy pictures but it will have to wait until Amy comes over again, because otherwise I won’t know if I’m messing up the characters or not. It will probably consist of me writing words like “Sweet Tea” and “Dumplings” but anything in a foreign language looks cooler than our English letters. I made it out to Metro the other day and saw some of my favorite American foods. They even had fruit loops. It’s really pricy so I limited my purchases, but I was able to find the first butter, and cheese that I have gotten since I’ve been here. I also found real American pasta so I’m planning to make Macaroni and Cheese for dinner one night very soon. You look great! That really looks like an upscale shopping mall. I’m glad you were able to find shoes. I love all the pics you’re sharing. The calligraphy mat looks really neat! It’s so nice it’s reusable. They think of everything! That dragon fruit is really a strange looking fruit! Talk to you soon! Awww, thanks Mom! The shopping mall on Hann Street was really upscale. I felt like I should push my nose in the air as I was walking around. We went in several of the shops and just looked around. The prices were outrageous. Even H&M which is considered a reasonably priced European store had higher prices than I would have liked. I did buy a pair of ballet flats there though, because it has been all but impossible for me to find shoes that fit here. I should be good in the shoe department now though because the other day Amy helped me order some from Taobao (an online shopping website) and I got them in the mail yesterday. Hope everything is going well. I’ll talk to you soon. I have to agree with the others….YOU LOOK GREAT! I am also glad you found you some comfortable shoes. 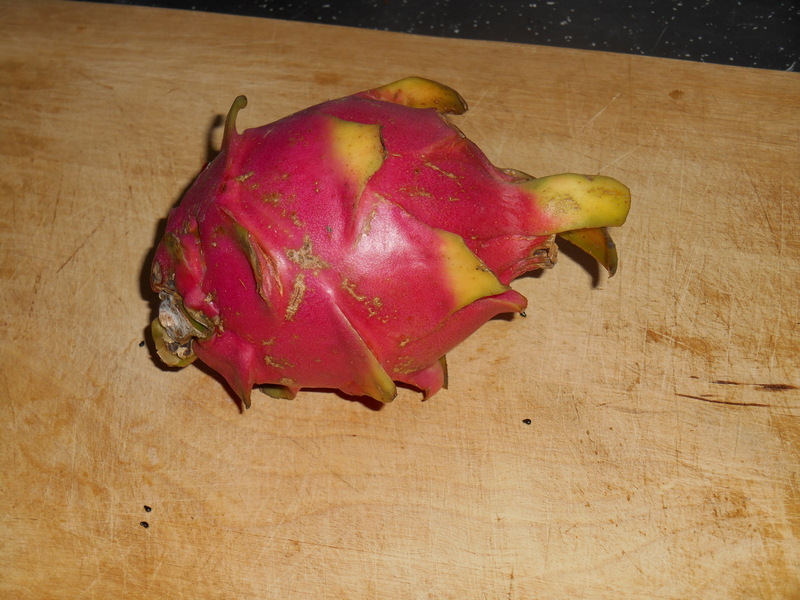 The dragon fruit is beautiful. I am so proud of all the people you have met. You are not hiding out in your apartment. You are adventurous, too. You have already been to so many places and experienced so many neat things. I’m not that adventurous. I’m a big chicken at heart, and most days I would be content to sit in my apartment and just write or play on the internet. I am trying to get out of my comfort zone though, but it takes courage. Yesterday was the first time I came home on the Subway all by myself, and when I took the bus, I got off 3 stops too early and had to walk about 6 blocks to get home. Lesson learned though, I know where the bus stops now.